This review of the season DVD from Gooner Review does more than look back at Arsene Wenger; it's just that I couldn't resist a pun on the old �fifties' movie "Look Back in Anger". However, this review of last season is not based just on the manager but on 10 themes chosen by Arsenal fans. Nor is it one of those reviews that concentrates on the successes and skates over the real problems. 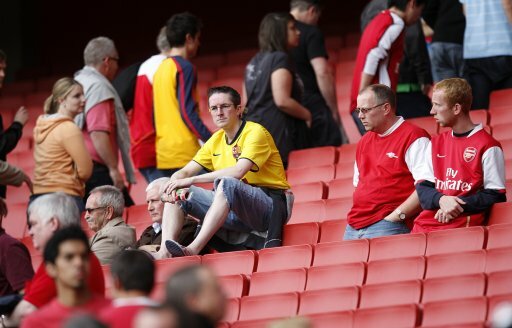 You know the sort of thing-Arsenal bring one out at the end of every season. All the winning matches appear, but if you blink you miss the important matches that were lost. Nor is it a collection of highlights as these were refused by the footballing authorities. Instead the participants, a broad range of Arsenal fans, from Paul Kaye, Bob Wilson, Perry Groves and other celebrities, all the way through to rank and filers discuss the season warts and all. I am not going to reveal the ten themes you can buy the DVD to get the detail. But I would be surprised if you didn't look at some of the issues in a new light after hearing the many differing views presented here. I can assure you that no one pulls any punches in this intelligent and fascinating review. It was touching to hear Bob Wilson say that he lost a whole night's sleep when Arsenal drew 4-4 with Spurs, and implied it ruined his birthday. Could you imagine any of today's players having a similar reaction? I was also surprised when he informed us that at the infamous shareholders meeting there was only one contributor who was rude to Arsène. As Bob said it was all dramatically exaggerated by the media. Although it could've been pointed out that Wenger made the most of it. Wenger's achievements were noted, including the new stadium, state of the art training facilities, and his numerous trophies. Nonetheless, his sometimes stubbornness saw one contributor compare him to Thatcher, that Wenger was not for turning. Nick Hornby pondered at what stage did a manager become dispensable, he felt that it could only be the case when a manager became delusional about the quality of his players. Whether Wenger has crossed that line or not is at the crux of much of the division that exists between Arsenal fans. It is ironic that perhaps the only high point of the season was the youth team. I say ironic because there is no doubt that Wenger has put much effort and resources into this area. It may be that this input will have long-term implications, but as Keynes said in the long term we are all dead. I could go on discussing these issues all day, and I have only touched on a small percentage of the issues raised, but that wouldn't be fair to the producers of this excellent DVD, instead I will direct you to the Gooner Review website where you can buy your own copy at Gooner Review. Do you remember when Silvestre was Arsenal Man of Match? Edited 1 time(s). Last edit at 2009:08:21:19:21:13 by Padre Pio. I dont think Arsene is delusional,if anything he is too loyal to players who have or do let him down.Bob Wilson is not only an Arsenal legend but a true fan and fans do worry and care immensly about their club,TH14 and PV4 and their ilk are also AFC fans IMO and that says a lot about the club.As for the youth question it would be foolish not to have this in place but how many players has or will it produce,its a real lottery and thats why a lot of fans would like to see more investment in the ready made dept.